In this post we will be analysing the current housing market in the Mediterranean island nation of Cyprus. According to the RICS Cyprus Property Price Index, published on July 4th, prices of both residential apartments and homes increased during the first quarter of 2016, 1.2% and 1.5% respectively. This comes on the heels of a dramatic price collapse for the Cypriot housing market; while the entire world felt the effects of the economic downturn of 2008, there was a disproportional decline in housing prices in Cyprus. There were two readily identifiable causes for the increased susceptibility of the Cypriot market: the reliance on injections of foreign investment capital, primarily from the U.K. and Russia, which all but evaporated when conditions took a turn for the worse back at home, and the title deed logjam that plagued Cypriot housing. The title deed debacle characterised Cyprus’s real estate development up until its collapse in 2008. The Cypriot Land Registry Office controls all of Cyprus’s title deeds, but is woefully understaffed and overloaded. Currently, it takes an estimated five to six years after the completion of a property before issuance of the title deed takes place. Mortgages, as a practice, were relatively unheard of in Cyprus up until 2000, and so lawyers were unaccustomed to running checks with the Land Registry Office prior to the sale of properties; the title deeds were, historically, always available, if just running a bit behind. This situation, however, was exploited by a handful of property developers. Using their land as collateral to finance further construction, developers used the backlog, alongside future sales, to clear these mortgages by the time the issuance of the deed occurred for the respective owner of the property. Then, when the recession began, this stream of buyers and funds that were allowing the process to be hidden dried up, and left scores of British home-owners with properties attached to mortgages they were unaware of. Understandably, this issue shook confidence in Cypriot real estate as an investment option, and led to a comprehensive restructure of banking policy. As of the time of writing, the practice of selling mortgage encumbered homes in Cyprus is all but done, but the after effects of the shock are still being felt. According to the same RICS report, as of Q1 2016, the housing market may finally have bottomed out. The areas of the country which saw the earliest market reactions to the economic downturn, identified as Paphos, Famagusta, and Larnaca, are now showing early signs of price stability. Retail and warehouse properties remain among the few which are seeing continued loss in value; offices and all types of residential properties saw increases between Q4 2015 and Q1 2016. The European Commission Country Report Cyprus 2016 further establishes that this rebounding likely results from recovery in the tradable services sector, which relies most significantly on external demand. Current average gross yields, however, suggest that Cyprus as an investment destination has yet to recover: as of Q1 2016, average gross yields for apartments were stable at 4%, with a markedly low yield of 2.0% for investment homes. These yields, especially in comparison to the generally accepted 7% benchmark of risk-reward in real estate, demonstrate that Cyprus is currently not as appealing an investment opportunity as other parts of Europe. Furthermore, the point is moot to anyone outside of the European Union – non-EU property owners are disallowed from renting out their property, and only citizens can benefit from rent control. 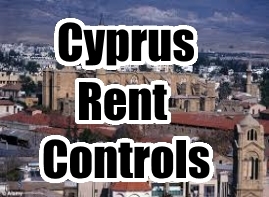 The rental market in Cyprus is subdivided into two categories: the free market, and properties governed by the Rent Control Law of 1983. This law applies to residential and business tenancies which lie within “Controlled Areas,” which are any towns, or suburbs which were completed prior to the 29th of December, 1995. After the first tenancy of a property under rent control has expired, the law allows for an increase in rent of 14%, but only after two years after the date of the last voluntary rent increase. In the event of dispute between landlord and tenant, the Rent Control Courts utilize the official value, and property factors (age, dimensions, location, etc.) to determine a “reasonable rent”. The Rent Control Law also introduced the “statutory tenant,” who is the person who remains in possession of the property at the time of the expiration of the first tenancy. A statutory tenant is protected from eviction unless: he fails to pay rent, the landlord needs the home for himself, his family, or dependants, or the landlord intends to demolish or affect substantial alteration to the premises. Even in one of the three above cases, the landlord may be ordered to grant the tenant a new tenancy upon reconstruction, or award damages equal to 9-18 months’ rent. One identifiable problem with the current measures of the strength of the Cypriot market is the low number of applicable transactions. This volume of transactions has rebounded slightly from all-time lows, but local buyers were particularly tight-fisted, owing to high local unemployment (14%) and high debt levels for locals.